The U.S. Navy held a keel laying and authentication ceremony for its twelfth Expeditionary Fast Transport (EPF) vessel, USNS Newport (T-EPF-12), at Austal USA’s shipyard., January 29. The keel was said to be «truly and fairly laid» as it was authenticated by Charlotte Dorrance Marshall, signing her initials into the keel plate. «We are excited to celebrate a major milestone in the construction of the 12th EPF of the class», said Captain Scot Searles, Strategic and Theater Sealift program manager, Program Executive Office (PEO) Ships. «These ships have proven versatility and capability, allowing them to be strategic assets to our fleet and partners abroad. The milestone we celebrate today is the first of many as we work to deliver another highly capable platform». EPFs are non-combatant vessels designed to operate in shallow-draft ports and waterways, increasing operational flexibility for a wide range of activities including maneuver and sustainment, relief operations in small or damaged ports, flexible logistics support, or as the key enabler for rapid transport. The ships are capable of interfacing with roll-on/roll-off discharge facilities, as well as on/off-loading vehicles such as a fully combat-loaded Abrams Main Battle Tank. EPFs support a variety of missions including the overseas contingency operations, conducting humanitarian assistance and disaster relief, supporting special operations forces, and supporting emerging joint sea-basing concepts. EPFs are capable of transporting 600 short tons 1,200 nautical miles at an average speed of 35 knots. Each vessel includes a flight deck to support day and night aircraft launch and recovery operations. Burlington will have airline-style seating for 312 embarked forces with fixed berthing for 104. 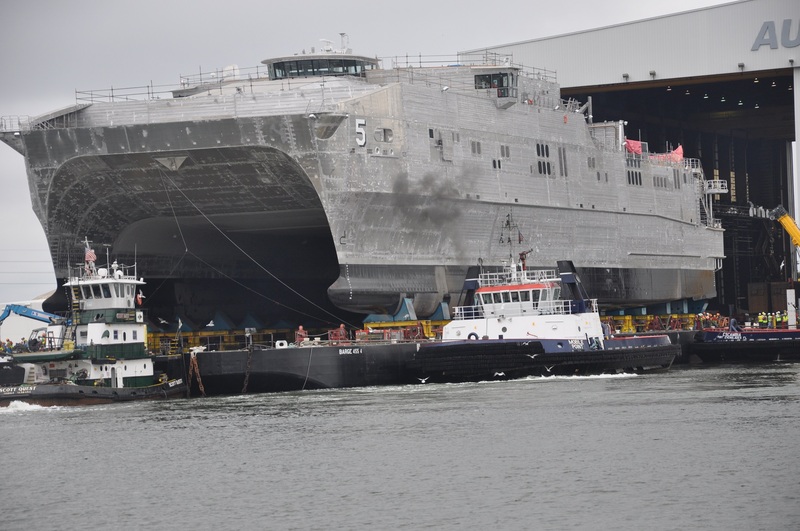 USNS Burlington (T-EPF-10) was delivered in November2018, and Austal USA is currently in production on USNS Puerto Rico (T-EPF-11), which was christened in November 2018. The U.S. Navy issued Austal long-lead-time material contracts in late 2018 for EPF-13 and EPF-14. As one of the Defense Department’s largest acquisition organizations, PEO Ships is responsible for executing the development and procurement of all destroyers, amphibious ships, special mission and support ships, and special warfare craft. 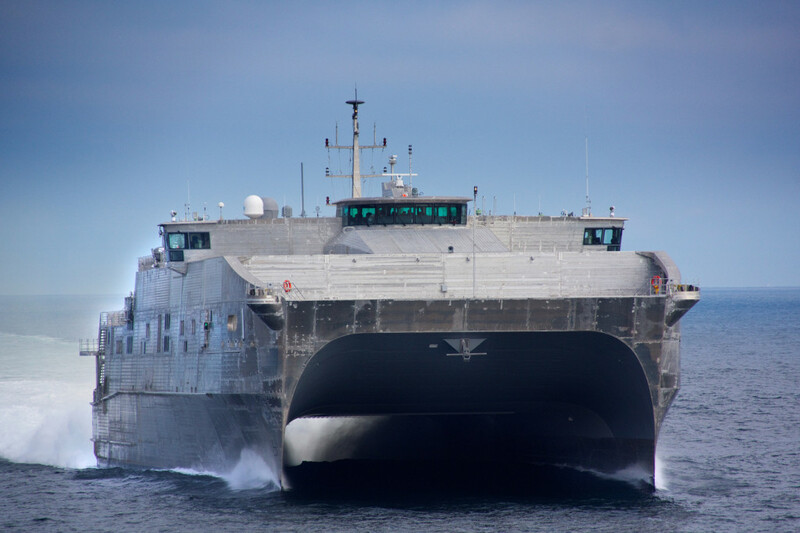 The joint high-speed vessel USNS Trenton (JHSV-5) completed acceptance trials at the Austal USA shipyard March 13, the U.S. Navy announced March 24. The week-long trials were held in the Gulf of Mexico and overseen by the Navy’s Board of Inspection and Survey (INSURV). INSURV worked alongside the shipyard to demonstrate the ship’s equipment and system operation to ensure it is ready for delivery and fulfills all contractual requirements. 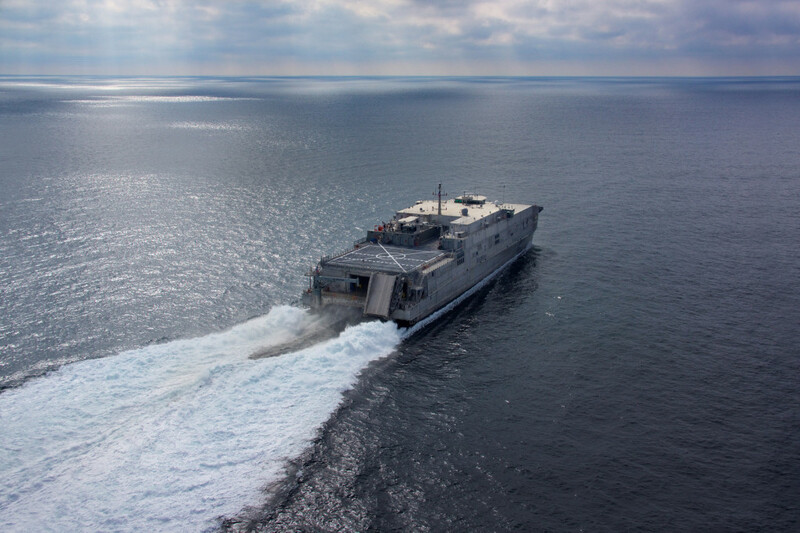 «USNS Trenton performed very well during these trials», said Strategic and Theater Sealift Program Manager Capt. Henry Stevens. «The rigorous testing each ship undergoes ensures the U.S. Navy receives the most capable and mission ready asset at delivery». JHSVs are versatile, non-combatant ships capable of transporting 600 short tons 1,200 nautical miles/2,222 km at an average speed of 35 knots/40 mph/65 km/h. They are equipped with airline style seating for 312 embarked forces, and fixed berthing for 104. 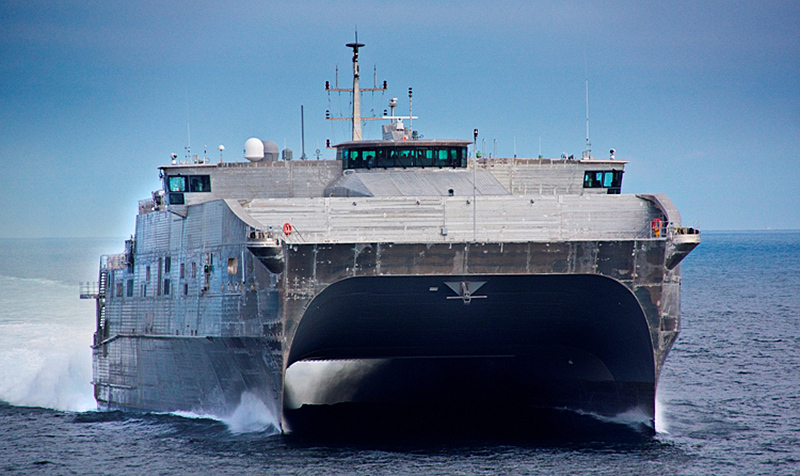 USNS Trenton will be used for the fast intra-theater transportation of troops, military vehicles and equipment. The ship’s 15-foot/4.6 m shallow draft, ability to interface with roll-on/roll-off discharge facilities, and ease of access to austere and deteriorated piers will facilitate littoral operations and port access. 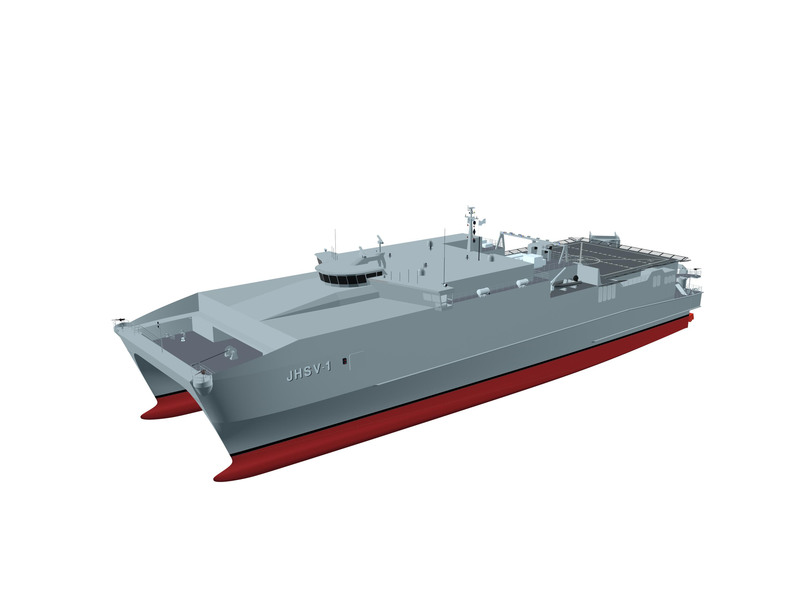 Having completed acceptance trials, USNS Trenton (JHSV-5) will now prepare for delivery to the U.S. Navy’s Military Sealift Command (MSC) later this year. The ship will be capable of supporting a wide range of operations including non-combatant evacuation operations, humanitarian assistance and disaster relief. The first four ships of the Spearhead-class have delivered to the fleet. The first two ships of the class, USNS Spearhead (JHSV-1) and USNS Choctaw County (JHSV-2) have completed overseas deployments to Europe, West Africa and the Caribbean. As one of the Defense Department’s largest acquisition organizations, Program Executive Offices (PEO) Ships is responsible for executing the development and procurement of all destroyers, amphibious ships, special mission and support ships and special warfare craft. Delivering high-quality war fighting assets – while balancing affordability and capability – is key to supporting the U.S. Navy’s Maritime Strategy.